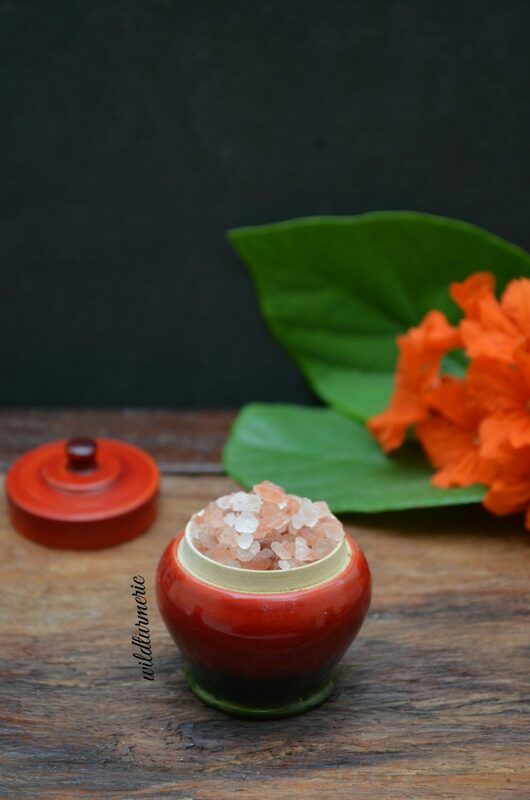 Pink Himalayan Salt | Sendha Namak | Saindhava Lavana has amazing health benefits, medicinal uses and therapeutic properties. From Himalayan salt lamp that purifies the air to using it as a scrub or bath soak that leaves the skin glowing, pink salt has wide uses. It has been used in Indian from ancient times and occupies an important place in Ayurveda. It is also a healthier substitute for our regular refined salt. Pink Himalayan salt was available only in health stores and herb shops in India before and usually in ground up form. Now since we get the beautiful pink crystal salt easily available everywhere, I have switched over to pink salt completely for cooking. Himalayan pink salt is an unrefined rock salt mined from the salt mines in Pakistan particularly Khewra salt mine. Though it is called Himalayan pink salt, it is not got from the Himalayan mountains. The Khewra salt mine is said to have formed 800 million years ago and is part of a salt range that formed during the evaporation of a shallow sea. The salt in the Khewra mine comes in various colors from pink, off white, red to transparent. Himalayan pink salt is also commonly called Pink salt, Himalayan Salt and Himalayan Rock Salt in English. It is called Induppu | indu Salt in Tamil, Sendha Namak in Hindi and Saindhav Salt | Saindhava Lavana in Kannada, Shende Lon in Marathi, Sindhalun in Gujarati, Saindhav Lavan in Bengali and Himalayan Uppu in Telugu. 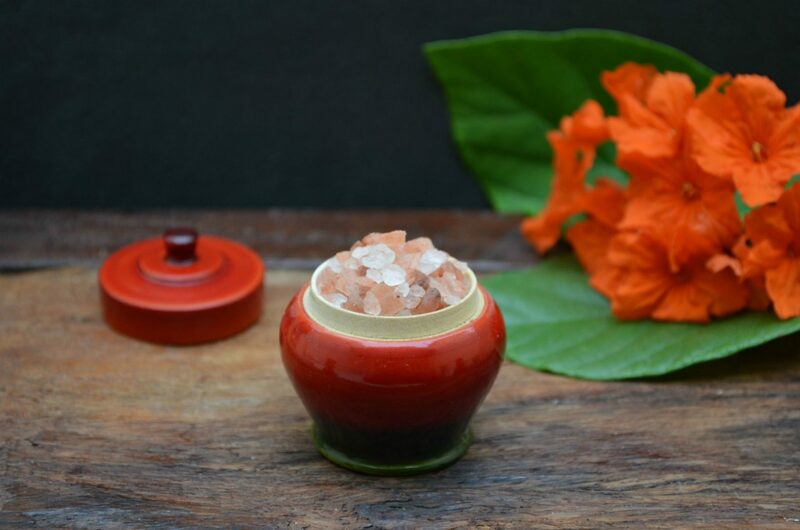 Himalayan pink salt just like our normal rock salt contains mainly sodium chloride accounting for almost 95 to 96 %. In addition, it contains minerals in small quantities like calcium, magnesium, sulfate, potassium, ferrous, zinc and chromium. 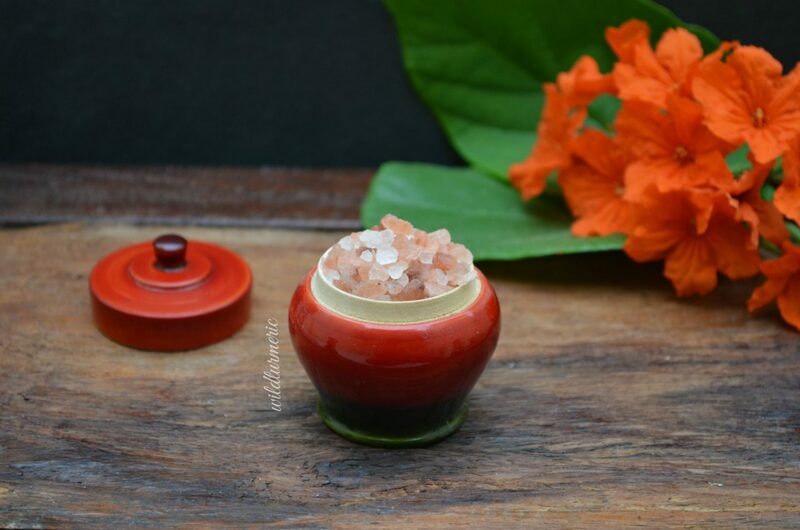 Himalayan pink salt has very very little amount of iodine in it and if you are advised to take iodised salt it is best to take iodine fortified natural rock salt instead of pink salt. 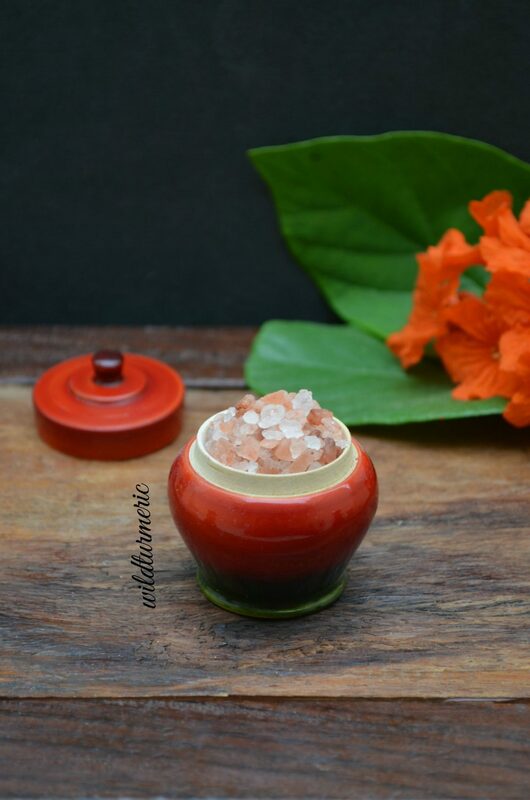 Though both Sendha Namak and Kala Namak are rock salts, they both are different. They differ in their appearance, smell, mineral content and where they are found. Both salts are extensively used in India and are easily available. Both sendha namak and black salt are rock salts and contains sodium chloride as the major ingredient. Both are highly valued in Ayurveda and are used extensively both in cooking and home remedies in India. Sendha namak is found naturally in salt mines whereas kala namak is made by mixing raw salt with charcoal and heating it in a closed furnace for 24 hours. Ingredients like haritaki, bhibitaki, babul and amla are added to the mixture. These ingredients helps transform the sodium sulfate into hydrogen sulfide and sodium sulfide which gives kala namak it’s distinctive eggy odour. 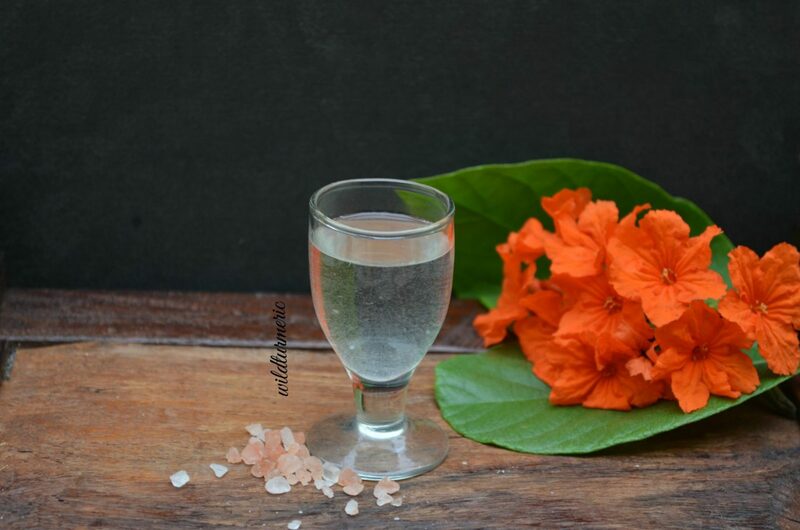 Sendha Namak mainly consists of sodium chloride along with small amounts of minerals like calcium, magnesium, sulfate, potassium, ferrous, zinc and chromium in small amounts. Kala namak consists mainly of sodium chloride along with sodium bisulfate, sodium sulfide, iron sulfide, hydrogen sulfide, sodium bisulfite, etc. 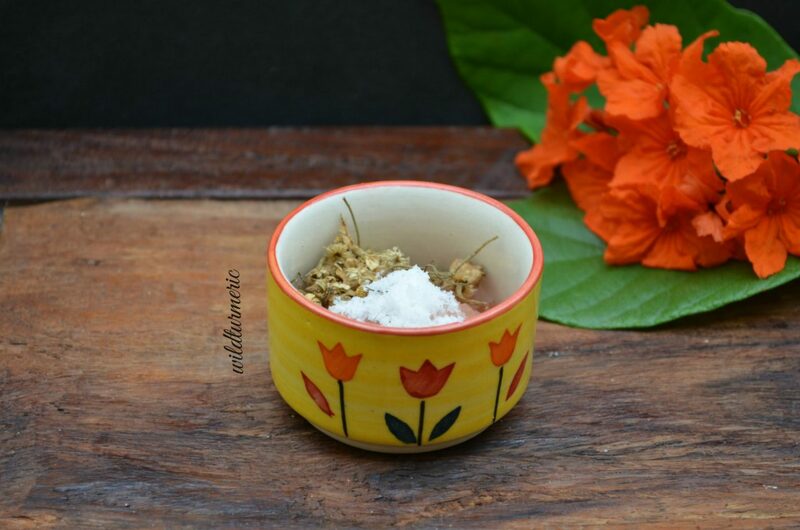 Sendha namak tastes exactly like regular salt and can be added to all the recipes while kala namak has a distinctive eggy smell, it is mainly added to chat items like pani puri etc. 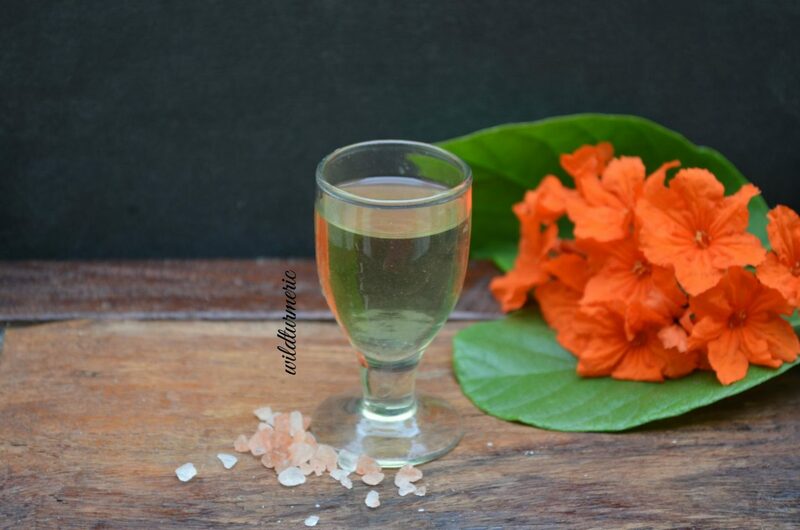 Kala namak improves digestion and is also a natural laxative. Sendha namak is mainly consumed for it’s mineral content. Sendha namak also is widely used for skin care. In short, they both are rock salts consisting of sodium chloride as the main ingredient differing mainly in their mineral content which gives them their distinctive color and smell. Like mentioned before, Himalayan salt is unprocessed so it contains trace minerals and since table salt is processed, it contains only sodium chloride. Table salt also contains anti caking agents to prevent it clumping so it is best to choose natural salts that are unprocessed like pink salt over processed table salt. But though pink salt is comparatively better than processed table salt it does not have loads of minerals like many claim. In fact any natural salt that has loads of impurities more than 8 % is not considered safe for human consumption as it can contain chemicals like lead which can harm our body. I have read in few books that Himalayan salt has low amount of sodium chloride compared to regular salt and the percentage of sodium chloride mentioned in various journals varied from 84% to 97 %. But in this chemical evaluation of salt deposits in Pakistan, it has mentioned that pink salt contains around 98.3 % sodium chloride so the trace minerals found are only 1.7 %. But it is because of this low percentage that heavy metals are in the recommended dosage in pink salt else it has to be refined for safe use. To summarize, pink salt is always better than processed table salt as it does not have ingredients like anti caking agents added to it but it also does not have loads of minerals like many claim. Finally for people who are suffering from iodine deficiency, it is best to consume iodine fortified rock salt than plain pink salt so always make your decisions depending on your personal needs. Though I couldn’t find a single study mentioning the effect of pink Himalayan salt on blood pressure, I did find a study that proves that unrefined salt has a positive effect on blood pressure when compared to refined salt. So it applies to unrefined Himalayan pink salt too and you can read the study that proves it here. But please remember that though pink salt is better than refined table salt, it is still very high in sodium. Many claim that pink salt has low amount of sodium chloride and high amounts of potassium compared to regular table salt which helps balance sodium levels. But from what I have researched, the pink salt we get in the markets including the one I buy is almost 97 to 98 % sodium chloride and the potassium levels are around 0.046 %. This is a very negligible amount. You should practice caution if you have high blood pressure and treat pink salt just like regular salt while consuming. Himalayan salt lamps are getting popular day by day. Himalayan salt lamps are nothing but huge chunks of Himalayan pink salt that have been carved out in the middle to fit a light bulb or heating element. When it is switched on, it emits a soft red glow. Himalayan salt bulbs attract the water molecules from the surrounding environment along with the pollutants that they carry. When heated they release the water and the pollutants are trapped in the salt. This greatly helps reduce the amount of pathogens in the air. Himalayan salt lamps greatly helps ease respiratory problems. Dry salt inhaling helps clear out the mucus and also removes allergens so it will greatly benefit people who are suffering from asthma, bronchitis and allergies. This process is called halotherapy and has been clinically proven to have positive effect on our health and has been in use for centuries. Halotherapy can be done using either dry or wet method. Himalayan salt lamps also are said to emit negative ions, negative ions have a positive effect on our mood and health. Nature is filled with negative ions that is why we feel energized when we visit a waterfall, river or pristine mountains filled with clean air. But the amount of negative ions that Himalayan salt lamps emit are said to be negligible but still considering it’s purifying benefits, it is a good idea to have a salt lamp at home. Himalayan pink salt tastes exactly like regular rock salt. Except for the color you will not find any difference in taste and flavor between regular rock salt and pink salt. I use pink salt instead of instead of rock salt now and I find no difference at all. It also does not have any distinctive smell. Pink salt is sold in different sizes and shapes. We get extra fine pink salt ideal for using in salt shakers, fine pink salt which is larger than our regular salt, medium pink salt crystals which are ideal for salt mills. I buy the medium pink salt crystals from a departmental store near our village. I first bought the finely ground pink salt but I like the medium pink salt crystals better and we also know it is pure when compared to the finely ground pink salt. Where To Buy Pink Himalayan Salt? Pink Himalayan salt was available only in certain herb shops before but now as it is getting popular it is sold in all the departmental stores in India. I would suggest buying pink salt only from reputed brands. The medium sized Himalayan pink salt is almost 7 to 8 times more expensive than regular rock salt. You can also easily buy pink salt through online shops too. Though pink Himalayan salt is best than our regular table salt, it is still almost 98 % sodium chloride so we should treat it just like regular salt especially people with high blood pressure. Also if you are using pink salt as a scrub, remember to crush it finely else it will cause small micro tears in the skin. It is so easy to make Himalayan bath salt at home, all you need are Himalayan pink salt, Epsom salt, baking soda and an essential oil. To make the salt bath, take a cup of Epsom salt in a mixing bowl, add in 1/4 cup of Himalayan pink salt, 2 tbsp of baking soda, a handful of dried flowers (I have used dried chamomile flowers) and 10 drops of your favorite essential oil and mix well. Store this blend in an airtight box, to use add a handful of this mixture to bath water. After a long tiring day, soaking in this blend will help you relax and reduce aches and pains and also will help you sleep better. 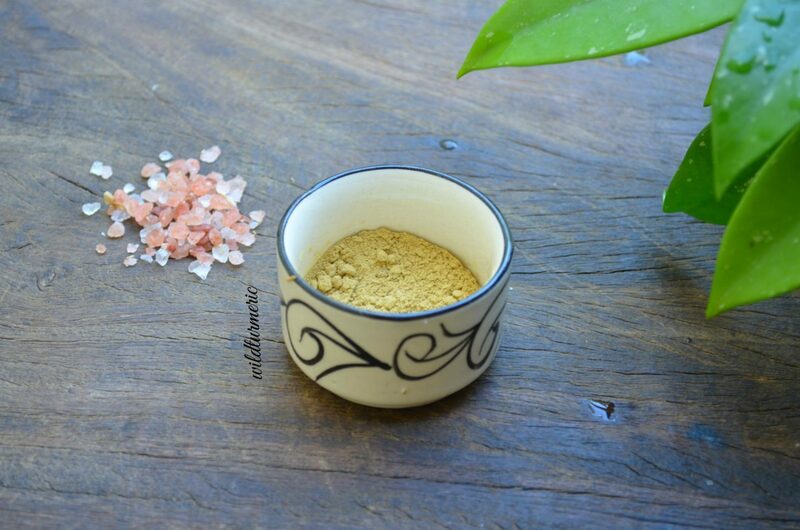 Haritaki and Himalayan pink salt combined together make an excellent homemade tooth powder. To make the tooth powder, take a tablespoon of haritaki powder in a bowl. Add in quarter teaspoon of Himalayan pink salt to it and mix well. Store it in an airtight bottle. This homemade tooth powder will store well for about three months, if kept away from moisture. If used as a tooth powder weekly twice, I can guarantee that it will completely prevent tooth decay and treat it as well. We make a simple decoction at home using pounded curry leaves, cumin seeds and Himalayan pink salt that greatly helps treat indigestion very quickly. For the remedy, take a handful of curry leaves, 1/4 tsp of cumin seeds and required amount of pink salt. Now pound them lightly in a mortar and pestle. Now take this mixture along with a cup of water and boil till it reduces in half. Once reduced in half switch off, strain and drink it warm. You will find immediate relief with this remedy. 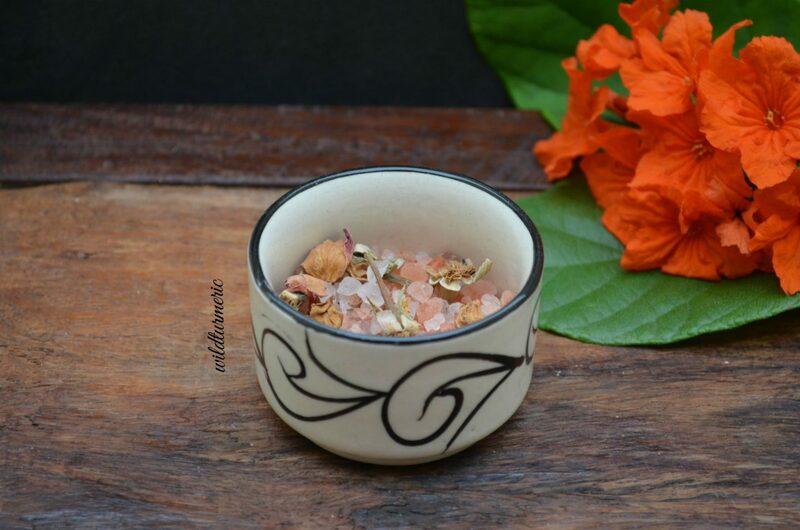 For the foot soak, take a handful of Himalayan pink salt in a bowl, add in a handful of dried rose petals to it and store in an airtight box. To use, take enough warm water in a tub enough to immerse your feet. Add in a 2 tbsp of the prepared mix and soak your feet in it for 15 minutes. This mineral rich foot soak will help soften dry feet and if you are suffering from leg pain will greatly help ease the pain. Sole water is nothing but saturated salt water. To make Himalayan pink salt sole water, take 1/4 cup of pink salt in a jug, now top it up with drinking water and leave it aside for an hour or two. Usually 90 % of the salt would have dissolved in the water and 10% of the salt will be remaining. Now the water is saturated with pink salt. To drink, add a tsp of this mixture to a cup of water along with a fresh squeeze of lemon juice. This sole water if had during summers prevent heat strokes. It also improves digestion, treats constipation and helps cleanse the colon very effectively.